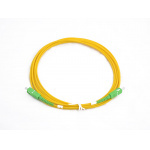 These patch cords are simplex or duplex pieces of cable of certain length and external diameter, terminated from both ends with connectors ST.
Reinforced optical patch cords fall into categories of speciality patch cords. They are used under harsh operating condition, where the probability of increased mechanical loading or rodent damage is very high. 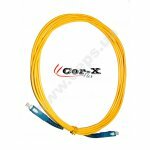 These patch cords are made from special reinforced optical cable with two flexible protective coatings made from non-rusting steel. 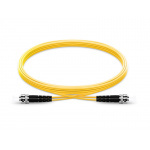 Fiber in thick buffer Ø 0,6 mm is additionally protected with a layer of kevlar. 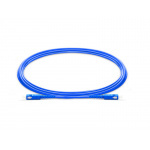 Cable coating is made from non-combustion spreading zero-halogen low-smoke material. (LSZH - Low Smoke Zero Halogen). 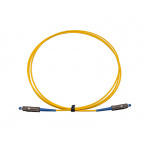 These patch cords are simplex or duplex pieces of cable of certain length and external diameter, terminated from both ends with connectors MU. Connector MU was brought into the world by Japanese telecummonication company NTT. 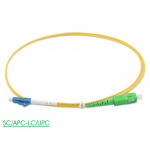 It is designed on the base of early developed by the same company optical connector SC, which is widely spreaded nowadays. MU dimensions are approximately twice smaller, than dimensions of SC. 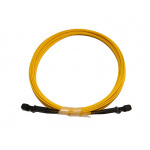 These patch cords are simplex or duplex pieces of cable of certain length and external diameter, terminated from both ends with connectors MTRJ. Connector MTRJ has a size of standard port of RJ type and 1/3 of a size of duplex connector SC, which provides high-density positioning. Connector MTRJ has a clip in RJ style, that is present on modular copper plugs. 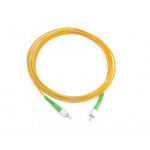 These patch cords are simplex or duplex pieces of cable of certain length and external diameter, terminated from both ends with connectors LC applying fiber, which complies with requirements of ITU-T G.657.A. 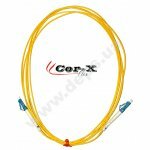 Patch cords are pieces of single (simplex) or double (duplex) cable terminated by connectors from both ends. 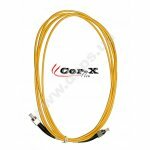 Patch cords are pieces of single (simplex) or double (duplex) cable terminated by connectors from both ends. For simple identification general colour marking is accepted: multi-mode patch cords are orange, while single-mode - yellow. 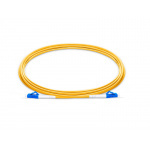 Patch cords are made from multimode fiber (62,5/125 and 50/125) or single-mode fiber (9/125). 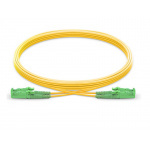 There are connecting patch cords (the same connector types on both ends) or adapting patch cords (different connector types on both ends).